It’s race day. You’re slightly nervous but you’re feeling focused and ready to dig deep. Your odds of winning are perhaps 1 in 50 racers, so how do you gain an edge on the competition? Assuming you’ve put in the training hours and your equipment and hydration are dialed, it’s time to put it all out there and demand the best from body and mind. Winning a criterium requires proper preparation, vigilant positioning tactics, keen attention to energy conservation, and a smart finishing strategy. While fitness is important, it’s the racer with the optimal combination of strong legs and smart tactics who will almost always win the race. Follow these race-day tips to boost your crit performance and take your racing to the next level. Your race preparation starts before you arrive at the course. Course and racer knowledge will help you prepare mentally for the race. Of course, a good warm up will get your legs and lungs ready for the effort. Prior to racing an event, be sure to mentally prepare yourself by researching the race course and competition. Understand the race route, road conditions, weather including wind direction, and take a look at the registration list to assess your competition. As a general rule of thumb, the shorter the race, the longer the warm up should be. Crits are full gas from the start, so it’s important to prepare your mind and body with a focused warm up that gradually increases intensity and lifts your heart rate to threshold. The increased blood flow, increased muscle temperature, dilated blood vessels, and increased acidity in the body will prepare you for the high intensity of crit racing. 3 x 25 to 45 second accelerations (up to 150 percent FTP). Rest 20 seconds between efforts. Spin up to 120 rpm. 5 to 10 minutes: Zone 1/2 heart rate (50 to 75 percent FTP). During your warm up, visualize your race strategy and mentally prepare. No matter how big or small your field is, being in the right place can make a big difference in your race. From the start to the finish, being aware of where you are and what is happening around you will help you ride more efficiently. Arrive at the start line at least 10 minutes early and upwards of 40 minutes early for larger races. By starting at the front of the race, you can avoid wasting energy trying to navigate through the pack and evade obstacles like stalled riders. Offer yourself a confidence boost and tell yourself you are a contender who belongs at the front. Maintaining your position in the pack requires you to continually scan for opportunities to move forward in ways that require the least amount of energy. 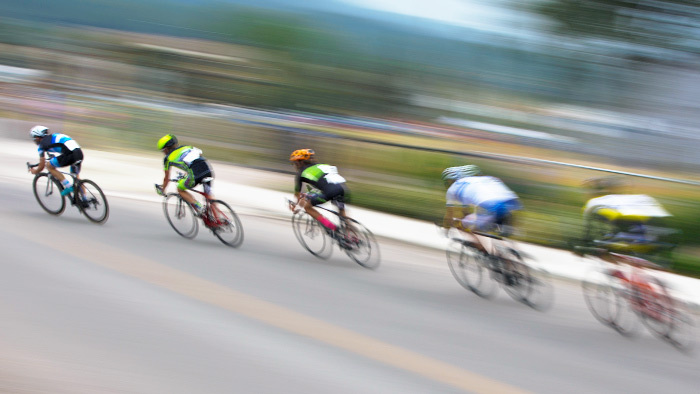 If you lose focus, you will quickly find yourself at the back of the pack being subjected to surges and decelerations producing a yo-yo effect that will quickly burn up your legs and expose you to potential crashes. While there may be more wind protection toward the back of the peloton, if you are riding without many teammates, it’s important to maintain your position toward the front of the pack but not at the front in the wind. Aim to stay within the top 10 wheels. This will allow you to quickly respond to accelerations and attacks, help you avoid getting boxed in, and allow you to conserve energy through avoiding sharp decelerations. Putting out your energy when it matters the most is an important component to having a successful race. Saving your energy for the critical moments will allow you to make it into the winning break, or take the sprint to the finish. While it may fuel your ego to show off your fitness and ride in the wind, it’s important to be calculated with your efforts and save your energy for when it really matters. The best crit racers are always assessing which actions are improving their odds of winning and which actions are decreasing their chances. Always have a reason for what you’re doing. Conserve your energy by paying attention to drafting and wind direction, following wheels to move up wherever possible, cornering smoothly, and learning how to modulate your accelerations and decelerations without touching the brakes. Every lap is a learning opportunity. Practice riding the course in various positions to find which route is fastest for you. Identify which lines will allow you to conserve the most amount of energy and offer you the best chances at winning. Knowing your strengths and weaknesses will help you determine your overall best strategy for a win. However, you also need to dial in your strategy during the race. There are a few things you can do in the race to help you determine exactly what to do. Prime laps give you a chance to suss out the competition, identify how you’re feeling and play out your last-lap strategy. Take advantage of prime laps to gauge a successful last-lap strategy. If the field slows in the last lap, it’s easy to get overtaken by riders behind you and lose your position. Listen, keep your eyes scanning, and anticipate which side of the road the inevitable accelerations will come from. Before it comes, start spinning up your gear to quickly hop on and move in on the incoming train. During the final lap of a race it’s essential to maintain your position. Depending on the course and final 500 meters of the race, you will likely need to position yourself in the top five or so wheels when the bell rings. Know your strengths and weaknesses to determine which strategy will provide you with the highest odds of winning. A winning strategy is one that requires both disciplined patience and unshakeable decisiveness. Stay focused, keep breathing, and never give up. The next time you toe the start of a criterium, keep these tips in your arsenal and unleash your best performance yet. Trust your abilities and remind yourself that you have what it takes to be a contender. Every race is a learning experience and an opportunity to elevate your cycling prowess. Build on each experience and enjoy the process of becoming a better racer along the way. Coach Sofia Marin is a Cat 1 racer and USAC cycling coach with Achieve Training & Coaching. Coach Sofia has a depth of experience coaching athletes to reach their potential and believes in supporting cyclists through a well-rounded approach that includes specific training plans, ride analysis, race strategy, sports psychology techniques, nutrition tips, and life balance. She is a passionate proponent of women's cycling, having worked closely with UCI Team TIBCO-SVB as Communications Director for the past five years. She helps athletes of all levels reach their goals in road, mountain, cyclocross, and triathlon. Contact her at www.achieveptc.com or view her TrainingPeaks Coach Profile. Follow her on Twitter at @sofidmarin.